The Bears Pit: v1.13 Bug Reports » LBE Bug "NADA"? Home » MODDING HQ 1.13 » v1.13 Bug Reports » LBE Bug "NADA"? Says there's not enough room. Inventory screen still shows + / - stuff like I have something picked up, but I don't. I can't click on anything to clear it out. if I exit Inventory and try again things are still showing +/- like I have somehting picked up. If I try to right click and edit the containers on the thigh rig again it changes cursor to NADA and the game is non-functional from that point on ... force close and restart/reload. I had another issue where I saved the game and came back to the sector to find most of my gear missing. I had militia dump their belongings but nothing new turned up, and most of my stuff was gone. Extended ears, all of my medical kits, a bunch of LBE's etc. Not sure whether that was it was militia equip code (I have sector use turned on) but I wouldn't think they'd grab it except on a sector load, and it was already loaded (I just did an Options > Save, didn't exit or reload the sector). I haven't been able to reproduce it however, would like to ask if anyone reads this do militia periodically try to re-equip on their own? That's the only explanation I could think of for a whole mess of gear to disappear. You'd think a militia inspection would return it? But not so I guess. This happens pretty much anytime an item is added to a full LBE parent - after the "There is not enough room" dialog is displayed the interface becomes fubar'd (even click & drop). There is a workaround that keeps you in the game (better than force closing). Immediately after getting the message; the cursor is empty but acts like there is still something on it. All inventory slots show the red # as if you could place something; but do not allow you to interact with them. If you immediately close out of inventory, save the game, then reload the game, the cursor is still goofed; but all inventory slots now show a green number. Clicking on one returns the game to normal operation. 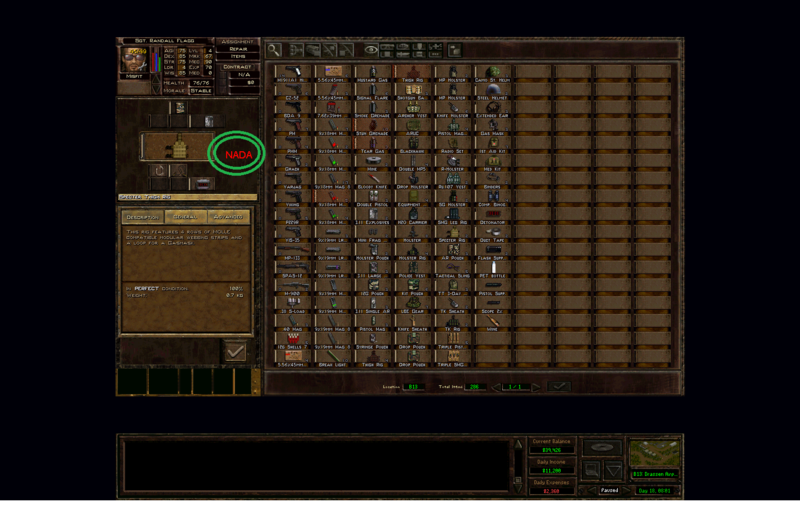 So after getting the "not enough space" message; close the sector inventory, save, load, open a soldier's inventory, click on an empty inventory slot (you'll see green #'s) on them, then you'll be fine. Hmm, I can't reproduce the issue in the 8397 build. Just like you I have a "Specter Thigh Rig" (item 1676). At the top small slot I have a "Rifle Ammo Pouch" (item 1673). Right medium slot holds a "Russian Pistol holster" (item 1677). In total this occupies 24 of the available 27 volume. I can click on an empty slot and select one available item. I get the error message "There's not enough space for this pocket" but there is no lockup. I can also pick up a pocket from sector inventory and try to place it in an empty slot. I get the same error message but the item is still on the cursor so I can put it back to sector inventory. There must be something more that is necessary to cause this issue. This happens *every* time I try to overload an LBE. Doesn't matter what it is, the moment I get "there's not enough space for this pocket" it acts like I still have something on my cursor but there isn't; and I can't do anything with it. The odd thing whatever the issue is it *persists* after a save/load cycle if I save during the issue, and then reload it, nothing on the cursor but acting like there is (every inventory slot shows +2 in green, until I click on something). The UI elements stay grayed out until I pull up a sector inventory and close it; then I can continue like normal after a load. Worth noting I almost universally work with the sector inventory while the sector is NOT loaded (that way any items carried by militia are available). This is fixed in my latest exe. OTOH, somehow the code disallows adding more than one pouch of the same type, so it's a bit too safe now. I guess I used the ValidItemAttachmentSlot() function improperly? I add multiple pouches of the same type all the time. In fact, pretty much every time. ALso the issue is less universal than I thought. Sometimes I can add gear fine and the "I'm full" message doesn't break things; most times it breaks when I get the message. Save and reload works to recover. Wonder if it's because I'm using multiple grenade or mag pouches of the same type all the time? I had another NADA cursor lockup after I passed a detonator to a guy with 71 explosive and he failed to apply it to a stick of TNT. I was able to save. ON a reload it black screened (reload from within game) and gave an exception. On a restart of JA2 I was able to reload the game fine but he failed to apply it AGAIN and it broke the game once more. The third restart of JA2 I reloaded the game, tried again, and it succeeded.